Easy Gluten-Free Brownies. The best homemade gluten-free brownies. Thick, chocolatey and chewy! With a dairy-free option. There is something just magical about brownies. For any chocolate lover, it’s an easy chocolate treat that can be whipped up in a little over 30 minutes. Better than box-mix, these easy homemade brownies from scratch are fudgy, chewy and soft. You are going to ditch your favorite gluten-free boxed brownie mix when you see how easy it is to make gluten-free brownies from scratch. 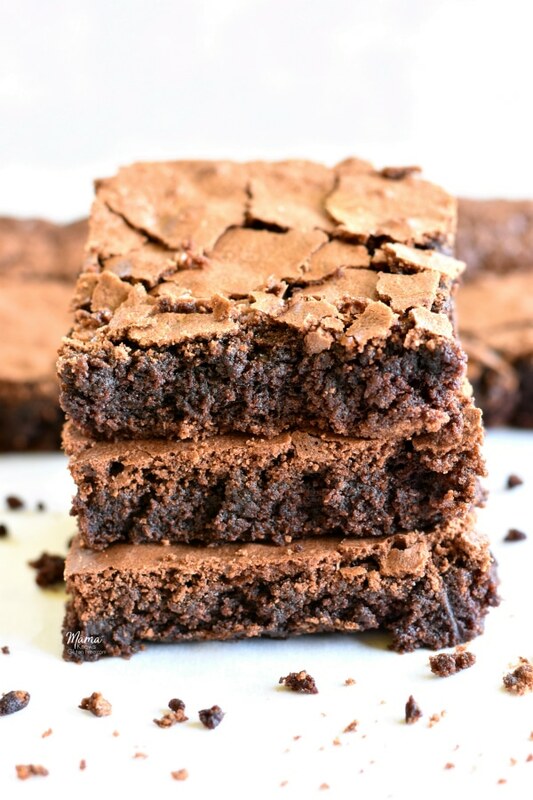 You’ll never want to make boxed brownies again! Bake for 30-35 minutes at 350 º F, or until a toothpick inserted into the center comes out just barely clean. I have also included a dairy-free option for the recipe. My husband, myself and youngest son are all dairy-free as well. So now, you too can enjoy a gluten-free and a dairy-free red velvet brownie. 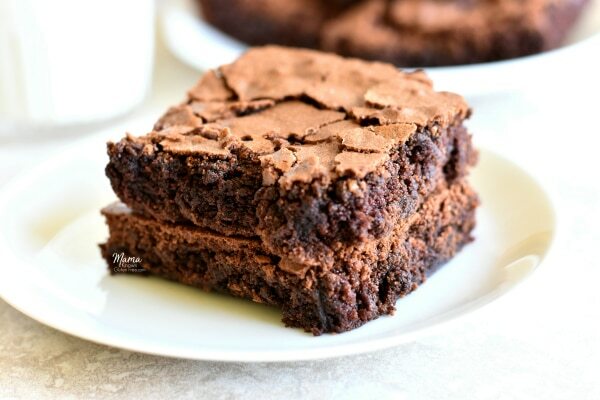 If you are a chocolate lover like me, you are going to be taken to chocolate heaven when you bite into these gluten-free chocolate brownies! I like brownies to have a flaky crust, be light like a cake but also chewy inside. But most of all, I want to taste the chocolate. These are the ultimate easy, gluten-free brownies made from scratch. Seriously you are not going to wan to buy a gluten-free brownie mix again! You can even add your favorite mix-ins like chocolate chips, M&M’s, or peanut butter swirls. They are perfect served by themselves or even better as a brownie sundae! If you are a chocolate lover you are going to love these gluten-free desserts and baking recipes. In a large bowl, add melted butter, pure vanilla extract, granulated sugar and brown sugar and mix until fully combined. Add in eggs one at a time and mix until fully combined. In a medium-sized bowl combine gluten-free flour, xanthan gum (leave out if your flour already has it), cocoa powder, baking soda and salt and whisk together. Slowly add the gluten-free flour mixture to the wet ingredients and mix until fully combined and smooth. 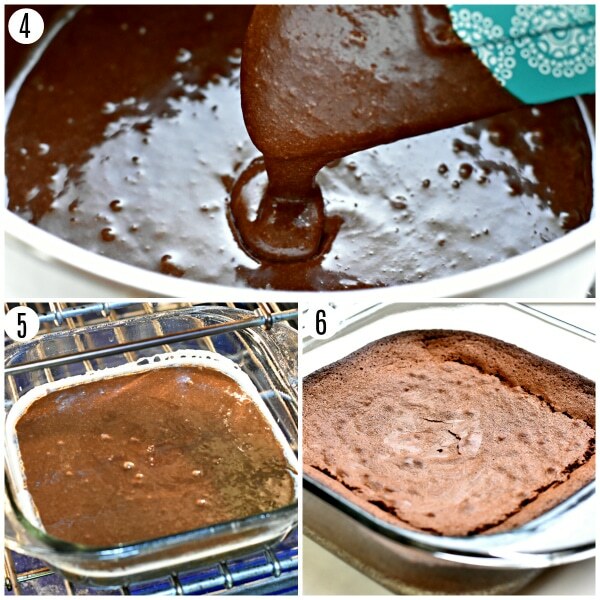 Pour the brownie batter to 8x8 sized baking pan. Bake for 30-35 minutes, or until a toothpick inserted into the center comes out just barely clean. The sides of the brownies with start to pull away from the pan. Please watch your brownies because all ovens are different. Remove brownies and allow to cool completely. Enjoy! Thank you so much Cindy! I hope your husband enjoys them. My husband loves these brownies. These look amazing! 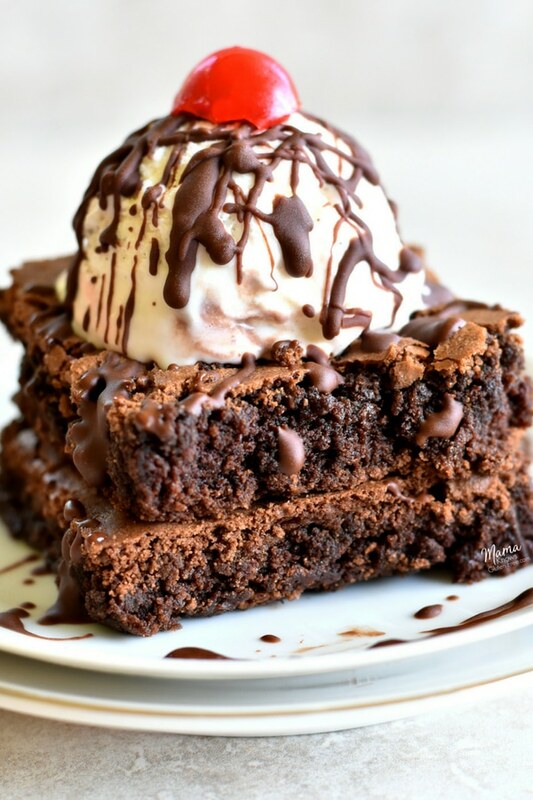 I love fudgy brownies. I can’t wait to try them! Thank you so much Lauren! I hope you enjoy them. I’m all about chocolate. I’m going to make these for the 4 th of July, but the crowd is large. Can these be made in a 9x 13 Pan? How does that adjust the cook time? Hi Heather! I have never made them in a 9×13 pan. I normally double the recipe and use two 8×8 pans. If you were to use the 9×13 pan you will have thinner brownies unless you double the recipe. If you don’t double the recipe and use a 9×13 bake 15 minutes and check them to see if they are done if not put them back in for 5 more minutes more and please watch them. Please let me know how they turn out in the 9×13 pan. I hope everyone enjoys them! Sounds great, I’ll double it and let ya know! Absolutely delicious! Made these tonight for the first time. A very good and easy recipe. Don’t hesitate to try this one. Thanks!! I need to make brownies for a guest of our community supper who is gluten and dairy free. Could you tell me how to adjust this or any other recipe, please. Hi Pam! This recipe is gluten-free with a dairy-free option. For dairy-free brownies you can use melted Smart Balance or Earth Balance butter or melted coconut oil. I use Pillsbury gluten-free flour. Most recipes you can substitute Smart Ballance butter for regular butter and use almond milk instead of regular milk. 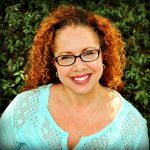 All of my recipes are gluten-free and most of my recipes have a dairy-free option in the ingredients and instructions. Please let me know if I can help in any way. So delicious! My favorite way to make was with part almond flour! Also added some chocolate chips for my sweet tooth daughter! Rich and tasty! Thank you Helena for the wonderful 5-star recipe review! I’ll have to try it with part almond flour. I’m with your daughter about adding extra chocolate chips. The more chocolate the better! Thanks again! love this recipe. I am ten years old and love to bake turned out great. I used a diffrent tipe of dairy free butter and coconut sugar instead of brown sugar. Thank you so much Sage for the wonderful 5-star recipe review! I am so happy that you enjoyed the brownies. I love to bake too! I have never tried the recipe with coconut sugar, but I am going to try it the next time I make them. Thanks for the tip. Thank you again! Oh my goodness! I just baked these! They are wonderful! I am waiting till they cool, but In had to cut the tiniest corner and taste… Wow! So good!! I used KAF All Purpose Baking Mix and it worked perfectly! Thank you so much for this recipe!! Thank you so much Carla for the wonderful 5-star recipe review! I am so happy that you enjoyed the brownies. I am glad that the King Arthur all-purpose gluten-free flour worked in the recipe. I really need to their flour. You are so welcome, I love sharing what I make for my family. Thank you again! 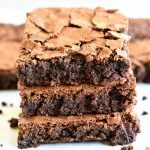 This is, by far, the best gluten free brownie I have ever had…..quite possibly the best brownie ever….definitely the best I ever made!…they are high…and chewy. 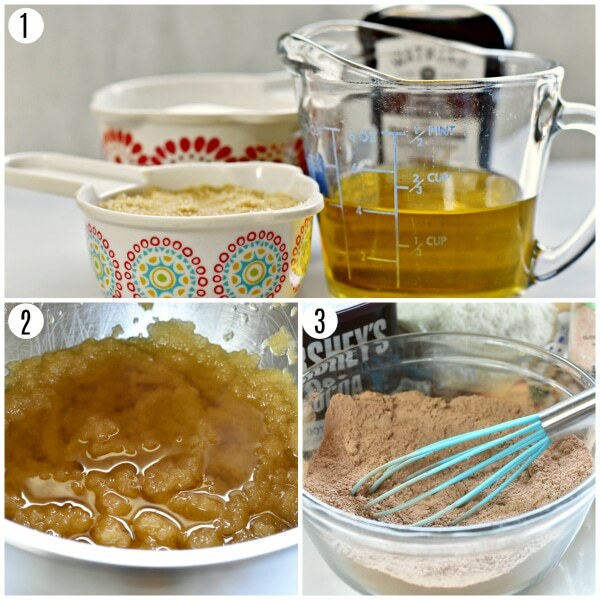 I used part maple sugar and organic cacao….I am definitely using this recipe again! Thank you so much Kerry for the amazing recipe review! You just made my night. I am so happy that you enjoyed the brownies and they are the best gluten-free brownies you have ever had! I have never tried them with maple sugar, that sounds amazing. Thank you again!